Summer is truly in full force now, so its time to get our sandals on and head to the beach, right? Whether your ‘cation is vay or stay, hopefully you’ll get some gorgeous sun, sand, and that cool sea breeze at least once this season! If you couldn’t tell yet, I’m addicted to JustFab.ca’s shoe and handbag collections, and they’ve got a ton of pretties this season. You should check out their Summer Shop Lookbook! And what’s even better right now is their BOGO deal, with 400+ items to choose from! 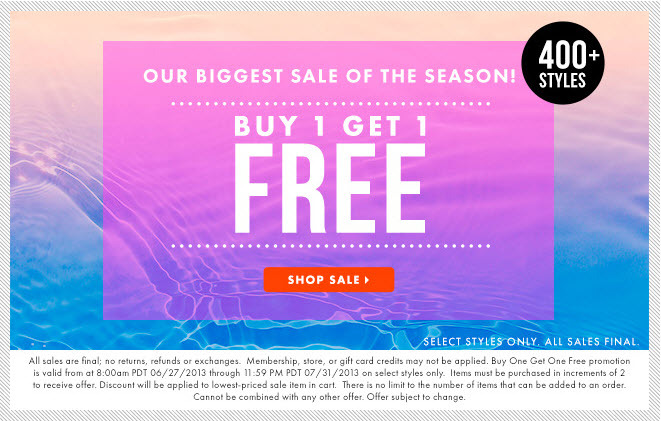 Until July 31st, you can pick out two of your fave styles for the season! How awesome is that?? Okay, so I’ve totally broken one of my News Years Resolutions… to not purchase anything black or white this year. I swear it wasn’t going to happen, but then fashion dictated that black and white was one of the best ways to go, so I’ve shelved that resolution for next year, lol! How have your resolutions come along now that we’re half way through 2013?? Am SO lucky that my clothes washing skillz are good enough to keep my whites their brightest! My wardrobe isn’t all black and white though (I think that would freak TheHubs out just a bit!) so there is some fun colours involved too! I’m loving this blue and red striped wedge; they’re so comfy to wear, though I have to admit, its taken me awhile to adjust to their height, lol. My shoes are usually no higher than an inch. So what are your favourite shoe trends for the summer? You are so pretty and I love the black and white dress. Me wants. I need to check this site out, Mama wants lots of these shoes and bags! I love sandels – have so many pairs and even a few I have never worn out yet! Guppy5700 That’s how it always happens right?? ;D Yeah I’ve got a couple pairs that make my shoe closet look totally pretty, but have yet to make my feet look fab, lol. Amazing stuff lady! I just put in an order for 2 things, and all my shoes are usually flat…I did pick a new handbag and some higher shoes! I can’t wait! My hubby says I have a lot of shoes and handbags…I use 1 handbag although I have about 5 all together and I have about 5 pairs of shoes as well. Yeah I am a real shoe and handbag hog! LOL However now that I am a justfab blogger I am in for some real trouble! LOL He isn’t going to know what hit him! Wow I have to check out that site, I love that bag! Iowa am in love with that purse actually! How cute is it? These are some amazing shoes too. Very colourful. Love them. those blue and red wedges are sweet!